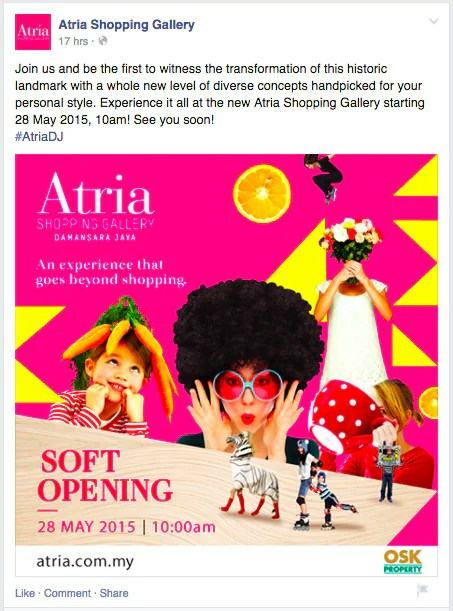 The neighbourhood of Damansara Jaya is ready to welcome back its famed landmark as Atria Shopping Gallery is finally “re-opening” its brand new doors on 28th May 2015. If you were from the 80s, you’d remember the popular neighbourhood mall called The Atria Shopping Centre – or more commonly/casually known as just Atria. During the 80s, way before the days of 1 Utama Shopping Centre, Mid Valley Megamall, Sunway Pyramid and the likes, Atria was the place that everyone wants to be seen at. The Piccadilly discotheque located inside Atria was a magnet for teenagers and students, receiving much attention for the frequent police raids on the outlet. There was also Parkson Grand, Parkson Supermarket, KFC, Esquire Kitchen, so on and so forth. Even when newer and larger malls (read: 1 Utama Shopping Centre, The Curve) were established nearby, Atria still remained popular. At least for awhile. You see, in the early 2000s, the complex was sold to Lien Hoe Corporation Berhad and quickly the Parkson supermarket became Tops Supermarket (under Netherlands’ Royal Ahold). In 2005, Tops Supermarket exited Malaysia (and whole of Asia) and the supermarket became Giant Supermarket while Parkson Grand relocated to 1 Utama. Later, Popular Bookstore too decided to end its presence in the mall. In March 2007, Lien Hoe Corporation sold the entire shopping complex to OSK Property Holdings Berhad. It was time for an overhaul. The new owners finally decided to redevelop the entire complex right from ground zero into a 5-storey lifestyle retail mall plus 2 basement levels. They also added two blocks of 16-storey towers above the retail floors. The towers contain 392 units of small office flexible office suites known as Atria SOFO Suites. The units were fully sold within a day of launch in November 2011. The all-new-mall will host mini anchor tenants such as Village Grocer, CHi Fitness and Taste Enclave, besides a large variety of food and beverage outlets and convenience outlets. The new Atria Shopping Gallery will also house a MANGO store, said to be the largest store in Malaysia, occupying almost 10,000 sq ft.
And just in case you’re worried about the traffic congestion once Atria Shopping Gallery opens, well, rest assured, several measures have been taken by OSK Property to address the traffic issues. It has improved the traffic flow of the surrounding commercial shops to one way, doubling the width of secondary roads and installed three new traffic lights and upgraded the older ones. There will be 5 drop-off and pick-up points, whereby one of them is elevated above road level aimed at dispersing traffic. Some 1,830 parking bays will be provided, and this is 3 times more than the number of bays offered by the former Atria. For more information, visit Atria Shopping Gallery website.